My google-fu appears strong this morning. Don't forget to use your number 16 scoop! Mix above and set aside to marinate for two hours or more. Put 2" oil in a wok. * Heat to 350°. Deep fry peanuts until golden brown. Remove and drain on paper towels. Lower heat to 275°-300°. Add the chicken pieces and stir to separate. Blanch in the oil until they turn white. remove and drain on paper towels. Work in batches if necessary. I usually line a sieve with paper towels and let drain over a bowl. Additional veggies if desired, chopped. Zucchini, red bell pepper, carrot, and onion are good choices. Slightly brown all the chili peppers in the oil. Add the ginger, garlic, and scallions. Stir-Fry until garlic is golden. Add the veggies and stir-fry until mostly done. Mix the sauce ingredients and pour into wok. Stir-fry until sauce is thickened. Add in the chicken and stir-fry briefly until done. Add peanuts. Mix well and put on a serving platter. *If you don't want to do the oil blanching, first mix chicken pieces in 2 tsp baking soda and let set for 10-30 minutes. Rinse chicken pieces in water and dry. Add chicken pieces to marinade mixture and set aside. Add 2 tablespoons of oil to the wok and add the peanuts along with the chili peppers. Add the chicken after the ginger, garlic, and scallions, then add the veggies. When almost done, add the sauce mixture and stir-fry until thickened. This makes a nice alternative to potatoes. Cooked the turnips in boiling salted water for 10 minutes, or until tender but still firm to the bite. Drain. Melt the butter with the honey in a frying pan. Add the turnips and cook, stirring for 3-5 minutes or until glossy. Stir in the almonds, then pile the turnips onto a warmed serving dish. Season with salt and pepper. Pour over the pan juices and sprinkle with the cilantro. I found a very cool Cambodian cooking website A while back. It has tons of interesting recipes. I made this one for lunch today, and it was very satisfying. I used two serrano peppers and one jalapeño pepper, because that's what I had. It was enough heat to be satisfying, I think, but I will prolly go hotter next time. Flash likes his spicy! You can see my pics at the bottom. 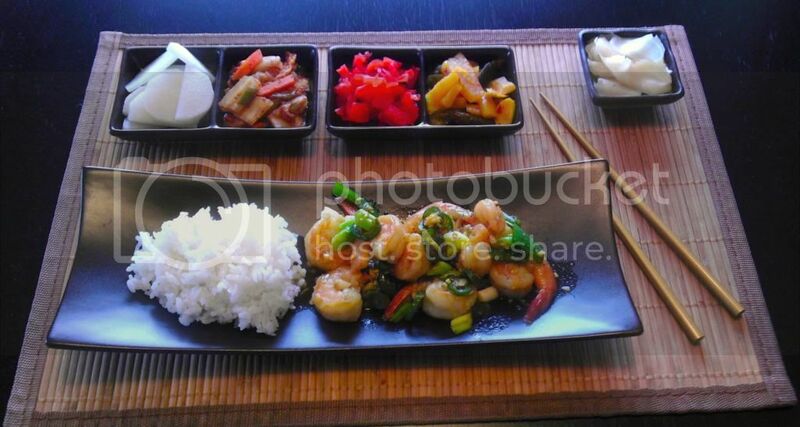 This delicious hot and spicy caramelized shrimp is authentic Khmer Krom country food. 1 lb Shrimp. Peeled and de-veins. First make caramelized sauce by put 1 tablespoon of water and 1 tablespoon of sugar in a small sauce pan. Cook and stir frequently till sugar turns dark brown color, immediately pour ½ cup water over caramelized sauce, stirs well. Add fish sauce, sugar and salt, stirs well, removed from heat and set a side. Heat up a skillet or wok with high temperature. When skillet is hot, add oil, garlic and shrimp, stirs well. Seasoning with prepared caramelized sauce and chili pepper, stirs till shrimp turns darker pink color. Add green onion and black pepper, stirs well. This was Flash's breakfast today: Shrimp, etc. 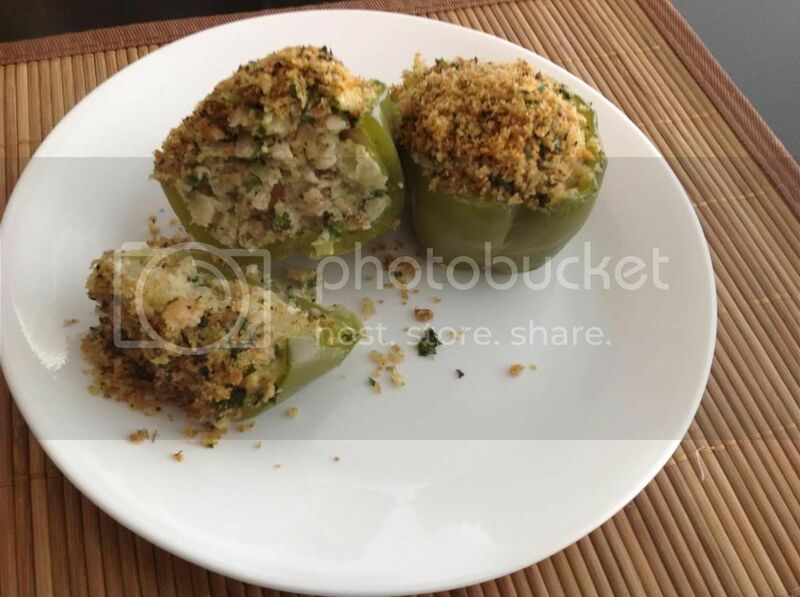 stuffed into a bell pepper. It was yummy. I'm a little weird and I'll eat dinner stuff for breakfast. Anyway, it hit the spot and was a nice Amount of food. I overcooked the bell pepper a bit. Oops. I did maybe 25% onion/celery, 25% fresh chopped bread crumbs, and 50% chopped shrimp to start. Ended up with a little more Shrimp and I tossed an extra handful of bread crumbs in, too. So whatever that comes out to. Was pretty good proportion. Maybe tad too much bread. Bake in oven at 350 for 30-60 minutes. I put it in a Pyrex dish with 1/2 cup water and lid for the first thirty minutes. Then I took off lid and added the Panko topping to finish. I Should have stopped at 40-45 minutes, prolly, but went to 55, hence the overlooked bell pepper. Oops. Double Oops: I totally forgot to put the oyster mushrooms in. Now I don't know what I'll do with them. Note that my oven runs cool, so it probably won't take as long if yours is accurate. Flash, thank you! You inspired me to make an Asian salad thingy tonight. Also, the recipe for the turnips I will try. I love turnips. I did finally find a recipe for a southwestern veggie dip that's similar to the one I used to be able to get at the grocery store. It's a clone of a taco bell sauce, of all things, that was Tweaked to make it better. It uses mayo and sour cream as the base, but I'm thinking of trying greek yogurt next time. So I'm not trying your recipe for now Flash. I really need to get rid of the koriander, some potatoes, apples and oranges (for juice) and a lemon. Anyone an idea? I think about frying the turnips with some oil and then add some apple slices...? Is that good? Or turnip soup with potato, onions, garlic and koriander? I only had turnips twice before and then I made soup... something new would be nice. Flash to the rescue, yay! Holy moly, how did I miss this thread before? Thanks so much Flash! I already made soup with it (olive oil, turnips, potato, onions, stock, garlic). But I love turnips and whenever I see them I buy them. I love the recipes with apple! I still got like 8 apples so I will try one of these soon! Sounds nice, Sawi! Let us know how the apple dish goes. Below is a recipe for an Indian mung bean soup. There are many variations, but I chose the simplest one to share here because it doesn't have a bunch of spices that you may not have on hand. This is a more delicate soup, quite unlike the spicy sambar. Serve it with bread or rice and a vegetable. To complete the meal serve yogurt or a green salad. The cookbook is worth having if you like Indian food, and there is a paperback "best of" version, too. Sort, wash, and drain the split mung beans. Combine the mung beans, water, turmeric, coriander, ginger root, and green chili in a 3-quart saucepan. Stirring occasionally, bring to a full boil over high heat. Reduce the heat to moderately low, cover with a tight-fitting lid, and boil gently for 1 hour or until the dal is soft and fully cooked. Off the heat, uncover, add the salt, and beat with a wire whisk or rotary beater until the dal soup is creamy smooth. Heat the ghee or oil in a small saucepan over moderate to moderately-high heat. When it is hot, toss in the cumin seeds. Fry until the seeds turn brown. Pour into the dal soup, immediately cover, and allow the seasonings to soak into the hot dal for 1-2 minutes. Add the minced herb, stir, and serve. Heat the tomatillo sauce in a small, covered pan over low heat. Warm up the chicken in a separate pan over low heat (sprinkled with a little water so it won't dry out), then stir in the crema or sour cream, onion, and salt. Set aside off the fire, covered. If the tortillas are moist, let them dry out out for a few minutes in a single layer. Heat the oil in a small skillet over medium-high. When sizzlingly hot, quick-fry the tortillas to soften them, one at a time, for 2 to 3 seconds on each side. Drain on paper towels. Preheat the oven to 350. Pour a cup of the warm sauce onto a plate. Lay a tortilla in the sauce, flip it over, lay a scant 2 Tbsp of the filling across the center and roll it up. Transfer to a baking dish, then continue filling and rolling the rest of the tortillas. Pour the remaining sauce over the enchiladas, being careful to cover the ends. Immediately cover the dish with foil and bake just long enough to heat through, about 10 minutes. Sprinkle the enchiladas with the crumbled cheese, decorate with onion rings and radishes, and serve right away. Boil the fresh tomatillos and chilis in salted water to cover until tender, 10-15 minutes; drain. Simply drain canned tomatillos. Place the tomatillos and chilis (raw chilis if using canned tomatillos) in a blender or food processor, along with the cilantro, onion, and garlic; if using a blender, stir well. Process until smooth, but still retaining a little texture. Oh flash, you've done it again. I grew up in south Texas, I think my first solid food was salsa. If I can ever get sleep and energy, I'll make these, it sounds really good. I think you'd also like this one, Rabbit. You can use chicken instead of pork, if you like. I usually make tacos the first day or two then make enchiladas with the leftover filling. I often like to fry corn tortillas in oil, because I like the crunch, but you could just warm them, of course. I serve with avocado, jalapeño, onion, tomatoes, cilantro or pico de gallo, lettuce, cotija cheese, and hot sauce. Bring about one quart of salted water to a boil in a medium sized saucepan, add the pork, skim the grayish foam that rises to the top during the first few minutes of simmering, then add the herbs and bay leaves. Partially cover and simmer over medium heat until the meat is tender, about an hour. If there is time, let the meat cool in the broth. Remove the meat, then drain the broth and spoon off all the fat that rises to the top; reserve 1 cup of the broth. When the meat is cool enough to handle, dry it on paper towels and shred. Seed the tomatoes, if you wish, then chop into 1/2" pieces. Heat the oil in a heavy skillet over medium heat. Add the meat, the onion, and the bell pepper, if using. Fry, stirring frequently, until browned, about 10 minutes. Stir in the garlic and cook 2 minutes. Add the chopped tomatoes and oregano, mix well, and simmer 5 minutes. Stir in the reserved cup of broth, chipotle peppers, and adobo sauce. Simmer gently for 10 minutes, then season with the salt and sugar. Thank you, flash, I'll try it! Sounds very good, and oh yeah, chipotles! When I was in San Antonio in February, I stocked up on dried chipotles. And I recently found some very good corn tortillas, not in the typical mexican section (like chi chi's or Monterrey) but in the Goya section. Very soft, and they puff up beautifully when fried. I'll have to see if I can find some tortillas like that tortillas here.